Today the TSB|AWF and Eyes on Animals team joined the Road Transport Inspection (ITD) east of Warsaw to assist in inspecting animal transports. 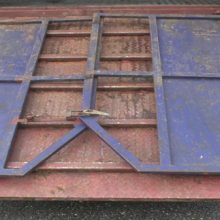 The first animal lorry stopped for inspection is empty, however the design of this vehicle raises our concern- the loading ramp at the back is much too steep and the lateral protectors not high enough to prevent an animal from falling off. We will contact the official that approved this vehicle to make sure the ramp is improved. A second livestock truck is stopped for inspection. It carries pregnant heifers from Czechia to Kazachstan. 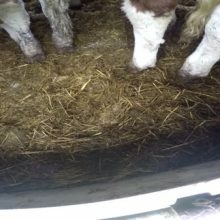 Unfortunately, we find several problems with this transport: the driver did not take any additional feed or bedding for the animals, which is obligatory for long-distance journeys. The animals were standing and lying in already very soiled bedding. Moreover, temperature sensors were defective and route planning was unrealistic. The driver and the transport company received high fines, and relevant complaints will be sent to the competent authorities.